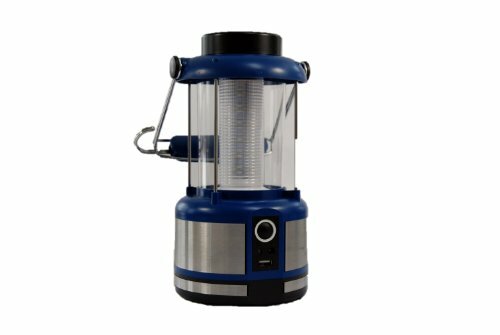 The Perfect Solar LED Lantern Package includes the LED Lantern w/USB Port, Rechargeable Battery, Solar Panel, and AC Adapter. SPECIFICATIONS : HOURS of USE: 15 hours LO, 12 hours HI CHARGE: (12) hours solar for complete battery charge., (8) hours by AC Charge Adapter. Input: 110-240V AC, Output: 5V BRIGHTNESS: 300 Lumens HI setting, 200 Lumens LO setting. RECHARGEABLE BATTERY: 3.7V Lithium-Ion Battery. Rated to charge 500+ times. A fully charged battery will hold power for 5 months. USB PORT: DC 5V/500MA Charges cell phone or other mobile devices. SOLAR PANEL: Weatherproof, Detachable- Non-Crystalline Photovoltaic cell 3W/9V, covered in tempered break resistant glass, aluminum framed. Sized 9.0 inches (H) x 6 inches (W) x 1.0 inches (D) includes a 9 foot lead wire. LEDS: (72) super-bright LEDS (Light-emitting diode), 360 degree illumination. LED illuminates 100,000 hours (30+ years on daily use of 8 hours) RUGGEDNESS: Lantern is water resistant - Shock resistant, can be operated in wet conditions MATERIAL: Non-Corrosive, ABS plastic and stainless steel. MICRO-CHIP CONTROLLER MGMT: Advanced circuit board protects against reverse polarity, overcharging and discharging. CHARGING INDICATOR: LED on Lantern changes from red to green when fully charged. STORAGE: Convenient water tight compartment on top of lantern body. SIZE: 10 inches (H) x 5 inches (W) x 5 inches (D). If you have any questions about this product by World Green Products, contact us by completing and submitting the form below. If you are looking for a specif part number, please include it with your message.